Living down under I basically follow the sun, which starts in the front room of our house and then gradually moves round to the back. So first thing in the morning, this is just perfect. I tend to draft my poems initially in pencil in one of many patterned notebooks, sometimes leaving it for a while, could be hours, days, weeks depending on how it ‘feels’ before typing it up on my laptop. I always carry a smaller notebook (the above are A5 size) and pen wherever I go in case inspiration hits me, or I hear, see, smell something that evokes a feeling or memory. Over the new year, I also took the time to organise my filing system so now have different coloured folders for my published work and correspondence, pending submissions, both to do and hear back from, and the draft of my first collection I’m working on (this was the perfect excuse to wander around many a stationery store, something I love to do, leaving the husband at home of course!) I used to be religious in recording my submissions, i.e. what has been sent to whom and when, etc., but then got lazy, which often happens with me I’m afraid. Now with my new Mslexia Writer’s Diary there is no excuse as it contains space for such records, and I’ve even got into the habit of noting what I need to do every Friday, my dedicated writing day and one of the reasons I went part time at work. So there you have it. My ideal place to write would be in a small but bright room filled with all things poetry and an interesting view, be it ocean, countryside or mountains (mine is currently our driveway). Working on this too! I love the fact that we are both part time and poets! 🙂 My writing space is something I dream of, we are still to get to the office/bedroom. 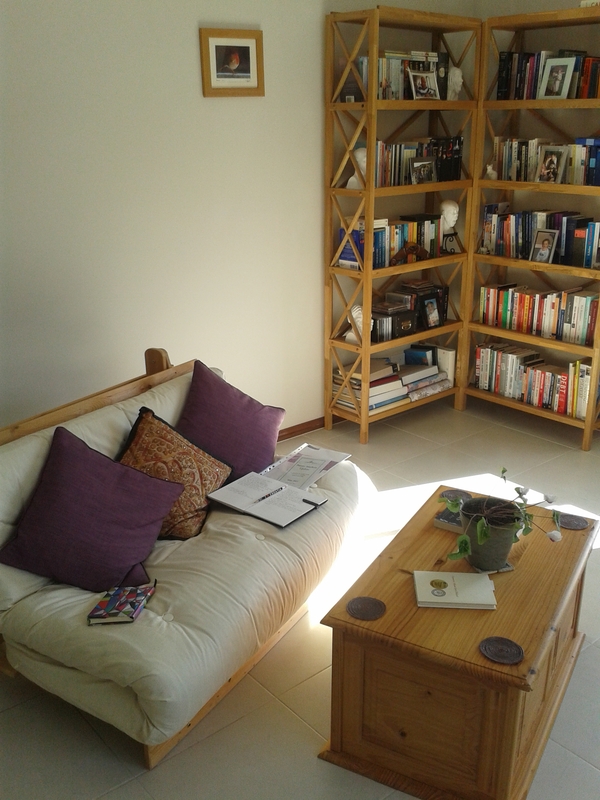 I use the front room for the light and sunshine, laptop/armchair. Sometimes I take everything upstairs and work from bed, light shining through the window. When my space is finally empty of boxes and decorated it will be organised with a filing shelf/ box units and maybe lots of inspirational things on the wall or at least an area to be madly (passionately) creative in. Once I start writing, I could be anywhere in the world and I wouldn’t really notice! You put me to shame with your tidy, organised space and your routine JVB. I am envious. I did set up an outside shaded area, intended to be a writing space, but it has become more of a ‘read and fall asleep in the recliner space’ and ‘sit and consume alcohol space’.